I wish I had gotten this review out earlier for many reasons. Of course it would have been nice if the show was still running and maybe some of you reading this could decide to go see it on my recommendation; it’s also a lot easier to write with the show freshly in mind. But mostly, I wish I’d gotten this review out sooner because I think the spotlight needed to land much brighter and much sooner on the production’s leading lady. 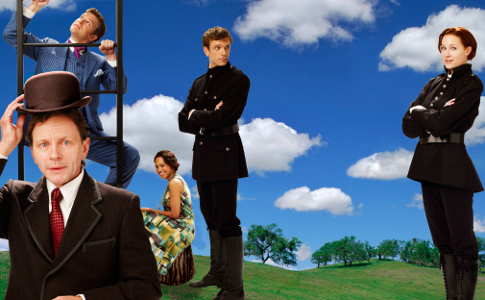 Most reviews of Stratford’s As You Like It were pretty favourable. Critics generally applauded director Des McAnuff’s bright and bold interpretation, cheered for heavy hitters like Ben Carlson (Touchstone), Brent Carver (Jaques) and Lucy Peacock (Audrey) in supporting roles and were taken away by the show’s wonderful music (Justin Ellington/Michael Roth). Indeed these aspects were incredibly noteworthy. Carlson’s Touchstone was a wonderfully pompous study of perfect comedic timing; Carver’s unsure Jaques was a unique creature pitch perfectly uncomfortable in his own skin; Peacock’s Audrey was adorably simple and grinningly fun. The music was indeed a highlight (the winning “It was a Lover and his Lass” has been stuck in my head as triumphant moment of theatrical giddiness ever since) and McAnuff’s interesting juxtaposed settings of the totalitarian court (ruled by Tom Rooney’s proto-Hitler Duke Frederick) and the surrealist forest of Arden (ruled by Rooney’s warm Duke Senior and populated by human trees and deer-headed pipe-smokers) gave the play a new kick. 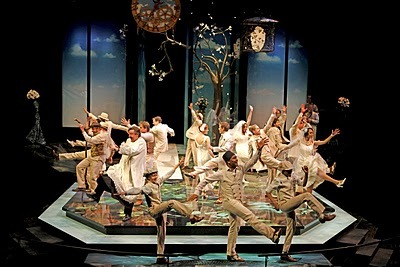 Designer Debra Hanson created a visual feast of colour and metaphor, making As You Like It the prettiest play Stratford may have ever done as well as one of the most visually meaningful. Rooney, Mike Shara (Oliver), Ian Lake (Silvius), Dalal Badr (Phebe), Dan Chameroy (William/Charles) and Brian Tree (Adam) round out the spectacular ensemble with truly excellent turns. Lake, in particular, is a wonderfully mopey and earnest Silvius while Rooney proves once again why he’s one of my all-time favourite Stratford performers in his dual role as the Dukes. Paul Nolan’s Orlando is simply a matter of taste. For me, his musical theatre roots shone perhaps a little too brightly, the scrappy Orlando reading as a tad delicate or goofy. 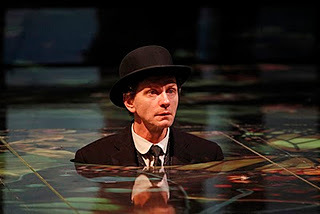 My fellow My Theatre writer Tessa, on the other hand, found him irresistibly charming. The issue of Cara Ricketts, however, is not up for debate. For the second time this season, Ricketts brings little depth and an obnoxiously light cadence to her ingenue role. While this may be forgivable in the somewhat shallow role of Perdita (The Winter’s Tale), such treatment of Celia is criminal. My favourite ingenue in the canon, Celia is uniquely funny and complicated. Her protective instincts, inferiority complex and fierce loyalty should not, must not be met with simplicity of portrayal. Alas, they were. But ultimately, not much of this mattered. Not the tree-people, the crazy smoking dear, the giant apple or heart replica suspended from the ceiling or the fact that Adam was inexplicably killed off from the usually happy-go-lucky play. The craziness, the highpoints, the lowpoints, the most established actors in the company, the wonderfully inventive musical style- it’s nothing without the leading lady. 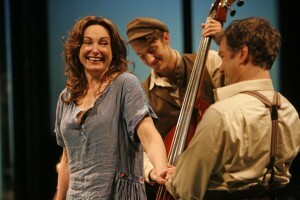 As You Like It is, at least in my view, the only Shakespeare play with a true heroine. Rosalind doesn’t have a male counterpart to overshadow her like Beatrice does (Much Ado About Nothing) and, unlike Viola (Twelfth Night), she commands most of the story herself, instead of being swept along into the action already unfolding. Rosalind moves plot unlike any other of Shakespeare’s women, she speaks the most lines in the play, enjoys the most stage time and sets her own tone. 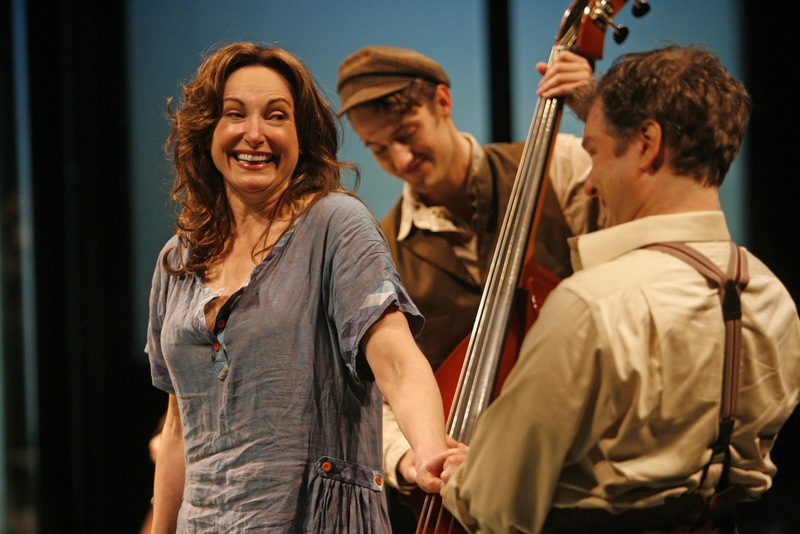 The play and the audience (much like Celia) are sad when Rosalind is and happy when she cheers up. It’s Rosalind’s story. Thus, Stratford’s 2010 production is Andrea Runge’s play. And boy does she run with it. A standout last season as Cecily in a brimmingly smart Importance of Being Earnest, Runge is my favourite young actress on the Stratford scene. Beautiful, engaging, emotive and clever as hell, Runge brings a perfect irresistible quality to her roles, enticing us to follow her into the story. 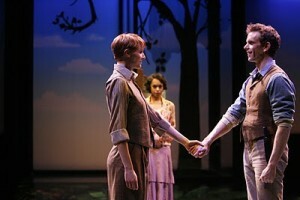 The world of Stratford’s As You Like It is a generally beautiful one filled with the occasional over-reaching pitfall. It’s populated by characters and performances as handsomely endearing as Mike Shara, as pitch-perfect as Ben Carlson and as formulaically annoying as Cara Ricketts. This maze of craziness (complete with changing seasons, rousing choruses and countless visual metaphors) is a fascinating place to spend 3 hours, but without Andrea Runge to lead us through it, we’d be lost just a few steps in.